A search engine advertising strategy newly tested by Zillow has raised the hackles of some real estate agents, spurring the listing portal to promptly suspend the experiment. 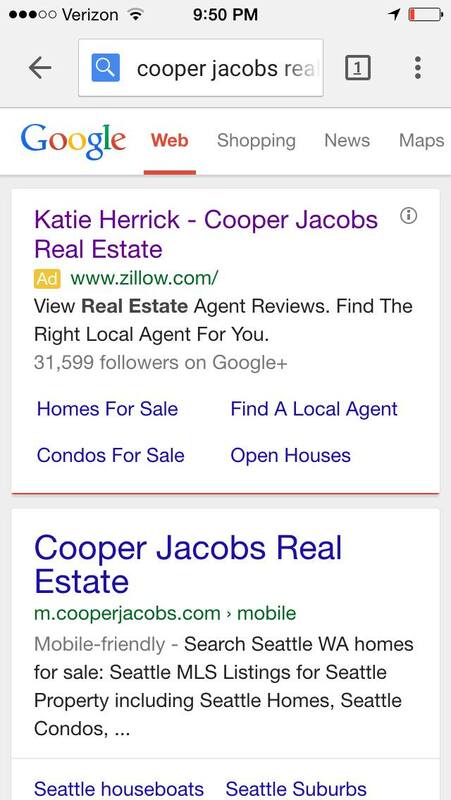 The advertising technique involves placing Zillow ads in front of Google users who search the names of brokerages. The main text featured in the ads would link to the Zillow profile page of an agent at the brokerage whose name was targeted or the brokerage’s Zillow profile itself. Smaller text, like “homes for sale,” appearing beneath the main ad copy, would link to basic sections of the listing portal. Some agents groaned on social media that the ads could direct traffic otherwise bound for their real estate brokerage or agent websites to Zillow instead. Even if the ads offer some benefit to real estate agents and brokers by driving up views of their Zillow profiles, they would hurt real estate agents or brokerages overall, critics argued, because the ads would poach traffic that would have been more likely to convert into leads had it gone to agent or brokerage websites. For its part, Zillow said the ads were specifically designed to benefit real estate agents. But harsh criticism has prompted the listing portal to put the advertising experiment on hold less than 24 hours after controversy around the practice began to brew. Some agents questioned the legality of using one company’s brand to capture Web traffic for another. But it’s actually fairly common for companies to use Google AdWords — the advertising platform that Zillow used to implement the advertising strategy — to place ads in front of consumers who search the names of other companies. Google AdWords, the advertising platform that Zillow used to target ads at consumers searching the names of real estate brokerages, says it prohibits intellectual property infringement by advertisers, and will investigate complaints alleging the use of a trademark in the text of a Google AdWords ad (but not the website URL shown with an ad). The search engine says that a complaint involving a registered trademark must include a trademark registration number. Complaints involving unregistered trademarks need to demonstrate valid trademark rights to every region mentioned in the complaint. “The process to become a trademark owner, either through registration or use rights, varies from region to region,” Google notes. Some agents commenting on Zillow’s now suspended ads said the ads had inspired them to claim more ownership of their brand.